Bag of food that contains cans of beer. Please see photos. 5/8 x 5/16. 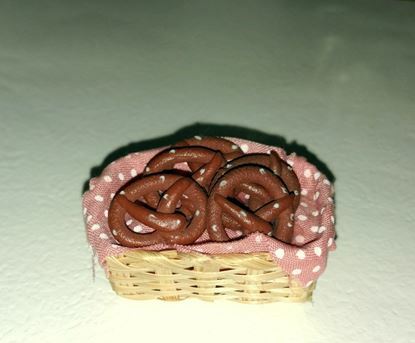 Miniature basket of pretzels measures 1 1/2"L X 1" w x 1" H. not intended for kids. This basket of potatoes measures 1 1/4"D x 1 1/2"H. not intended for kids. 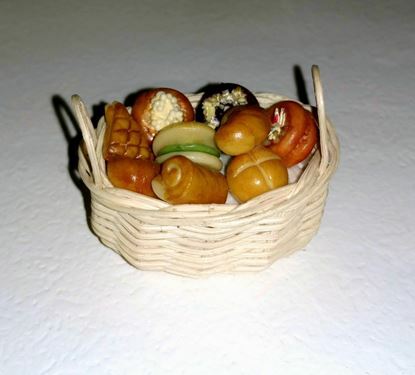 Really nice pastry basket, well made. The items in the basket are permanent and can't be removed. Measures 1 1/2" L x 1" w x 1 1/4" H with handles. Fragile, not intended for children.